Reflections on Faith and Culture: "Populist Constitutionalism"
The tea parties are a unique populist movement and moment in American history. There is no charismatic leader of the movement. The tea parties have more grass roots movers, shakers, and members, than any populist movement ever seen in our country. So what makes it so different from previous populist political factions? So what makes the tea parties different? I have attended several local tea party gatherings (and addressed a couple of them). 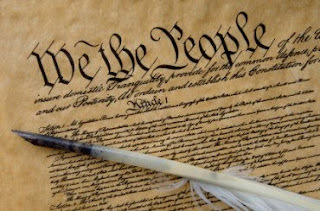 There is one document that is ubiquitous at these events: the Constitution for the United States of America. People hand out copies of the Constitution like hors d'oeuvres that are served at ... a de rigueur tea party. "Excuse me," a man interrupted us. He carried another box full of copies of the Constitution and set his box on the table next to her two boxes. He opened his box and began handing out the Constitution to the people who were filing into the meeting room. "Plenty," I told the woman and we laughed. "Populist Constitutionalism" - that's what the tea parties are all about. Love and respect for the Constitution is driving the movement. Sharing the document, and then discussing the meaning, purpose, and the ideas of the Constitution, that is the process that is taking place as a result of this love and respect. Gil, I'm not sure that all those U.S. Consitutions really mean much. They may be mostly symbolic, like Bibles that many Christians carry around without ever reading them. The movement is dominated by people whose vision of the government is conspiratorial and dangerously detached from reality. It's more John Birch than John Adams. The first speaker at the convention was Steve Malloy, author of "Green Hell: How Environmentalists Plan to Ruin Your Life," who claimed that Obama is an international socialist who envisions one-world government. Within a few hours in Nashville, I could tell that what I was hearing wasn't just random rhetorical mortar fire being launched at Obama and his political allies: the salvos followed the established script of New World Order conspiracy theories, which have suffused the dubious right-wing fringes of American politics since the days of the John Birch Society. --Obama is seeking to destroy America's place in the world. --Obama is seeking to sell Israel out to the Arabs. --Obama is a sort of Manchurian candidate, with Jeremiah Wright and William Ayers being the real brains behind the presidency. --Liberals engineered the financial crash. --Superannuated flower children engineered the financial crash. Perhaps the most distressing part of all is that few media observers bothered to catalog these bizarre, conspiracist outbursts, and instead fixated on Sarah Palin's Saturday night keynote address. It is as if, in the current overheated political atmosphere, we all simply have come to expect that radicalized conservatives will behave like unhinged paranoiacs when they collect in the same room.